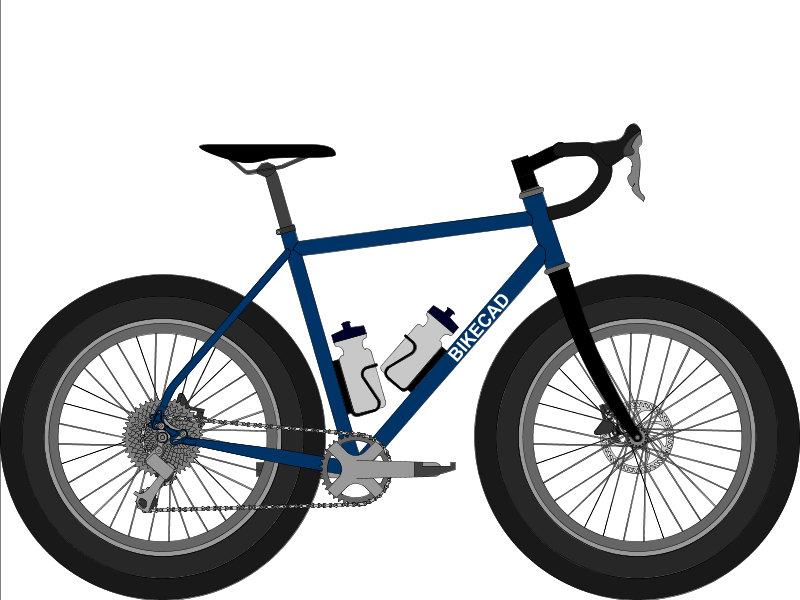 Drop bar bike with 24x4" tires (also clears 26x3", 27.5x2.5", and 29x1.8" tires). Paragon rocker dropouts, compatible with QR and TA axles. Several different variants were considered. The following describes Variant A. Boost-spaced rear sliders, compatible with 148mm TA and 141mm QR hubs. Can use regular 142mm TA and 135mm QR hubs with spaced inserts. Drive side offset of 13mm (up to 14.5mm). Fork may be selected to accept any of the four standards listed for the rear. Offset makes dishing the reverse of dishing on typical 135mm rear hubs. Bottom bracket is 83mm BSA. Designed to work with 1x11 and IGH drivetrains. Limited BB and crank options for mix of shell width and necessary chainline (low to mid 60mm). Unsuited for existing IG BB. More details (including variants and potential components) at the link listed under "More info".